So I have these neighbors. Everybody has them right? The ones who seem so perfect and they have to out-do you on everything? Yeah, that’s my neighbors. The thing about my neighbors though is that you really can’t help but love them! 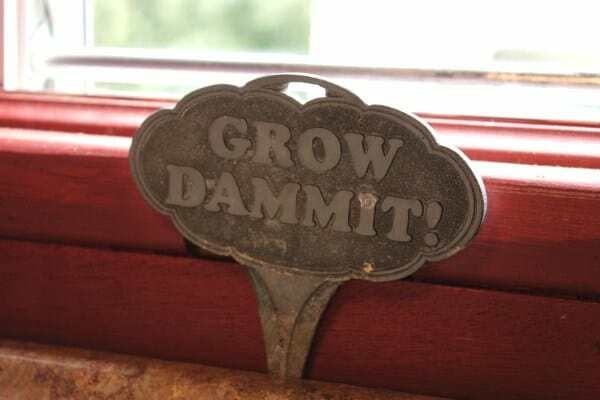 Yes, their yard always looks better than ours, their house is always immaculate, they have a garden that rivals any farmers market….The list goes on and on. But they’re the nicest, most generous couple you’ll ever meet. Their names are Gene and Shirley. They’re always there to lend a helping hand. We couldn’t have asked for better neighbors. Gene who’s 77 and Shirley who’s 75, are retired bus drivers from Frederick County Public Schools. Before that, Gene was a block mason for many years and Shirley raised their two kids. 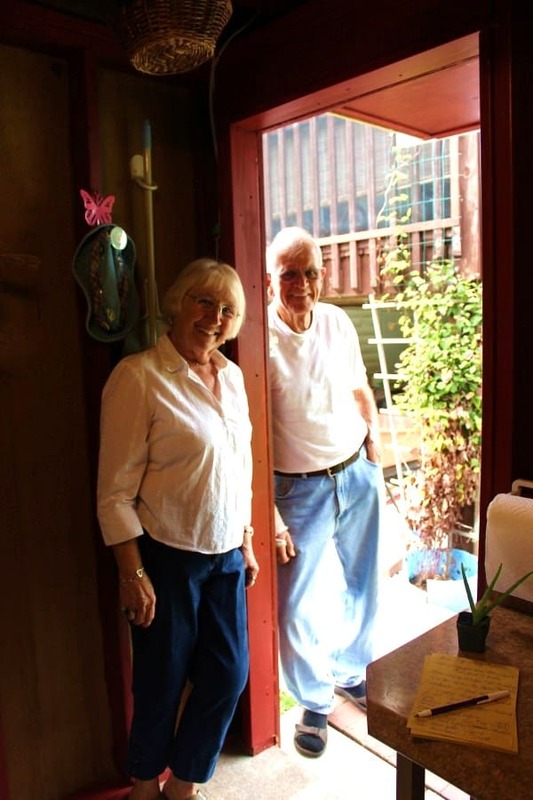 Gene and Shirley never cease to amaze me with their energy and zest for life. So when I looked out my window and saw Gene with a pile of wood and a ladder, I wasn’t surprised. He was building something. I just wasn’t sure yet what it was. After running into Shirley one day, she told me that Gene was building her a potting shed. Something she has wanted for many years. A place to store her many pots and baskets that she’s collected over the years. 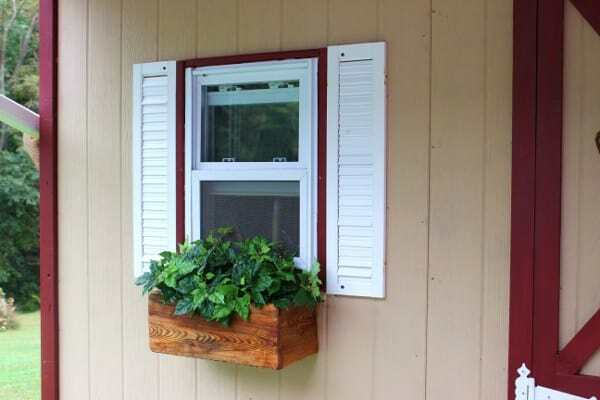 A place to pot her plants without making a mess on her front porch or in their garage. She asked her son to do it and he agreed, but with his busy job, he wouldn’t be able to get it started until the winter. Gene, being the chivalrous husband he is, decided he would build it himself. So off they went to get the materials to build Shirley’s dream potting shed. But they weren’t going to go out and buy all new materials. That goes against their grain. 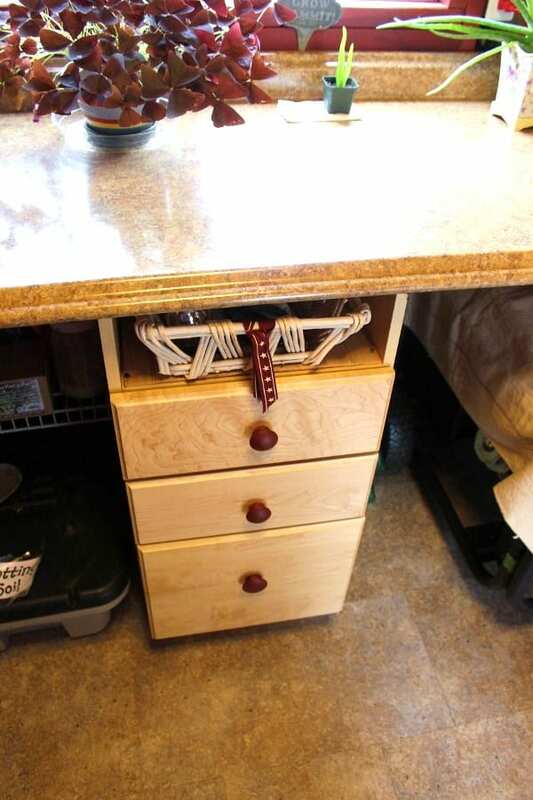 Being the practical people they are, they decided to use second-hand materials and make this potting shed an upcycled project. In the end it turned out beautiful and exactly what Shirley wanted. 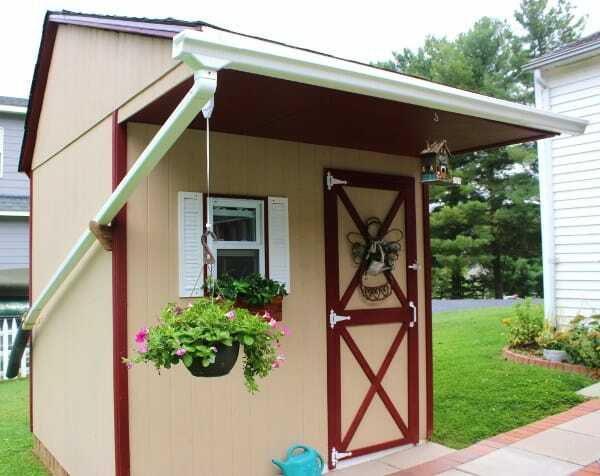 As a matter of fact, it’s the cutest little shed I’ve ever seen. And guess what? It only cost them a total of $697! How? I asked Shirley that same exact question. Being the meticulous and organized person she is, she was able to tell me. 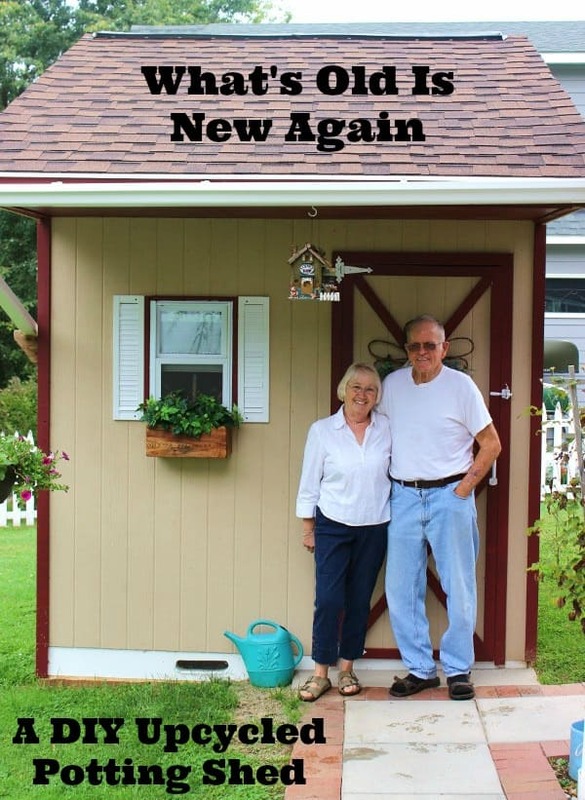 For the frame of the shed, Gene used all of his leftover lumber that he had accumulated through the years from various projects and jobs around the house. He made the flower box out of some leftover red cedar. Shirley brushed it with mineral oil. Cost? $0. The cute wreath on the door was a yard sale find. $1. 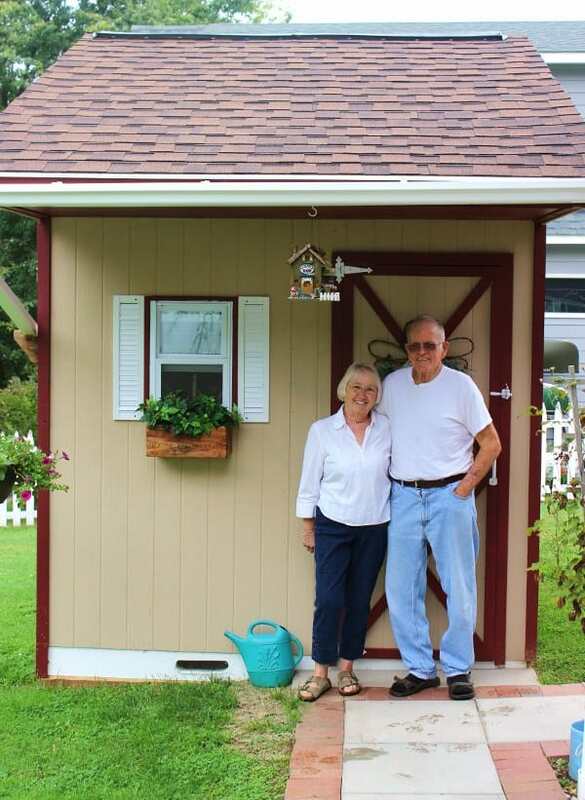 For the roof of the shed, Gene used his stored leftover plywood. Except, they needed one more sheet of plywood. So they got the one sheet they needed from Habitat for Humanity’s ReStore in Frederick for $3. 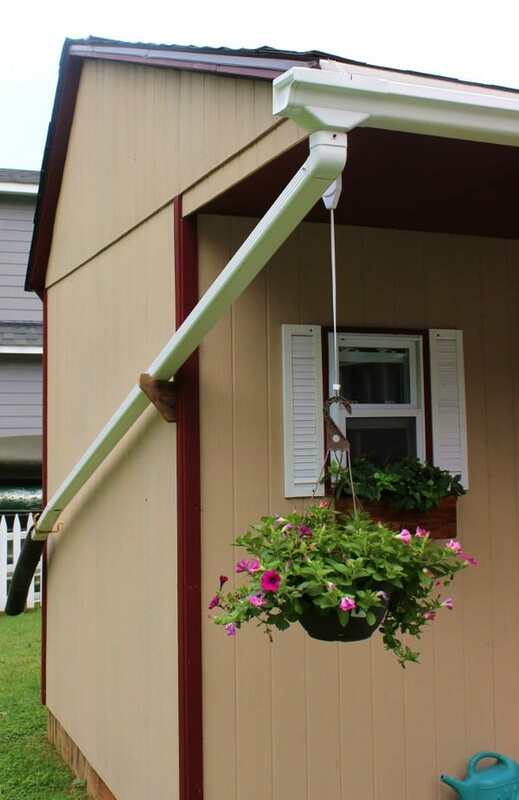 They purchased the gutter and downspout from Home Depot. You can’t have a roof without shingles. Shirley asked Gene how many shingles he needed for the roof and he said 3 squares. She looked on Craigslist and found the exact amount and color she needed for a total of $120. 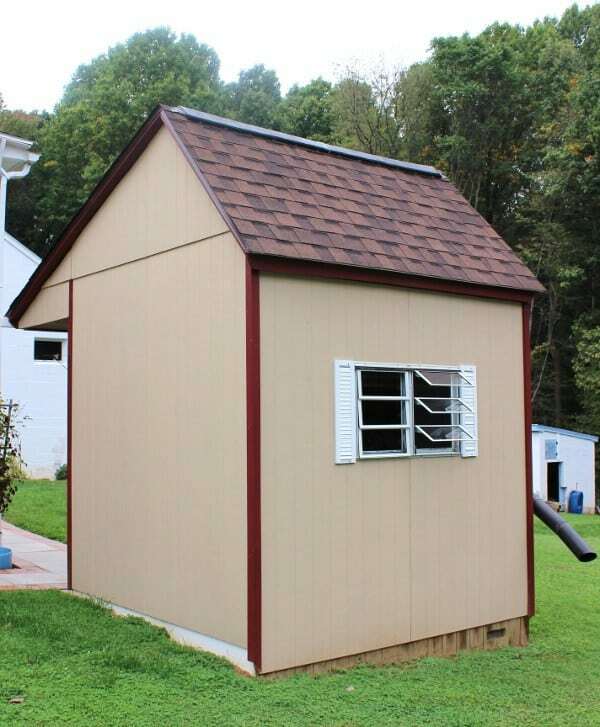 The siding was the most expensive thing on the entire shed. They couldn’t find recycled siding, so they went to Home Depot and bought 8 sheets of siding for a total of $160. 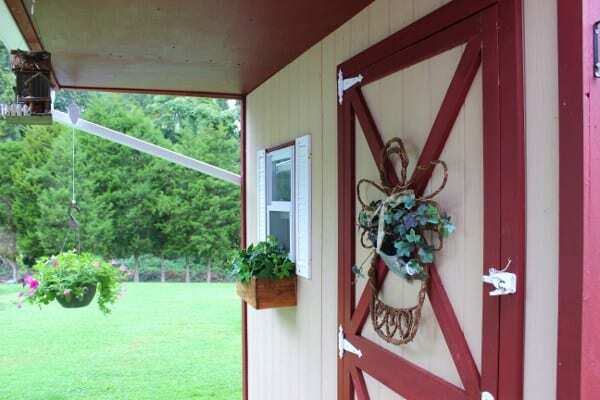 Gene made the shed door with scrap lumber and a piece of siding. 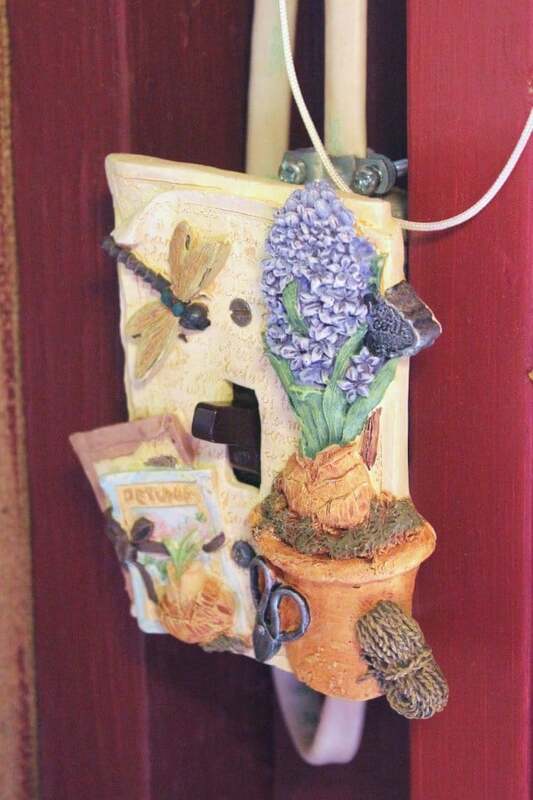 The hardware for the door was purchased from the Habitat for Humanity ReStore in Hagerstown, MD. 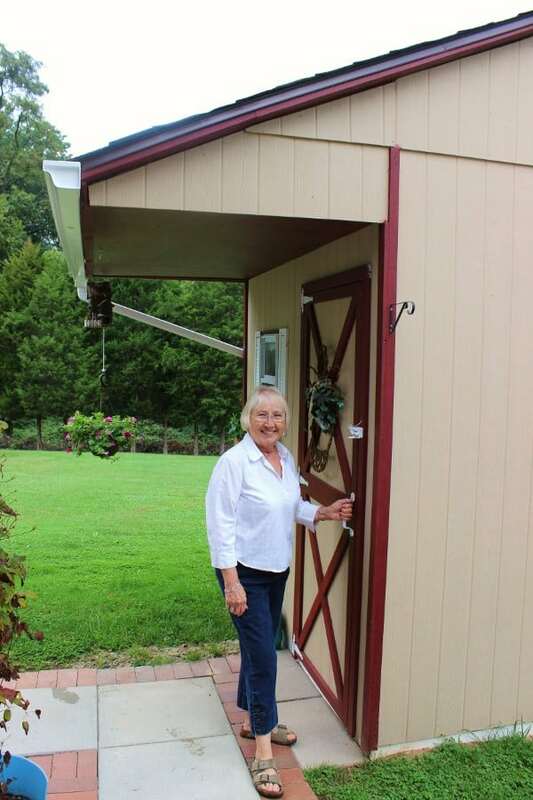 Shirley spotted the window on the back of the shed in her neighbor’s trash. She asked if she could take it and he said yes. $0. The window’s shutters came from Frederick’s ReStore for a whopping $3. 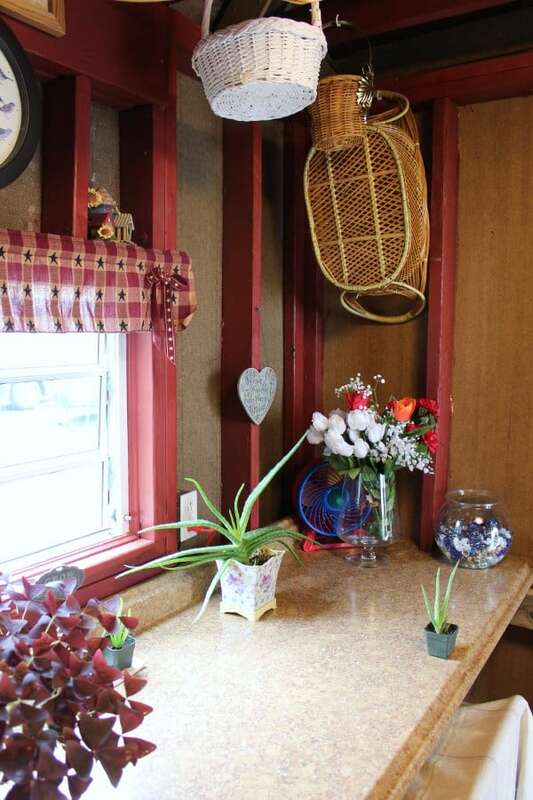 The adorable window on the front of the shed came from a yard sale. $3. 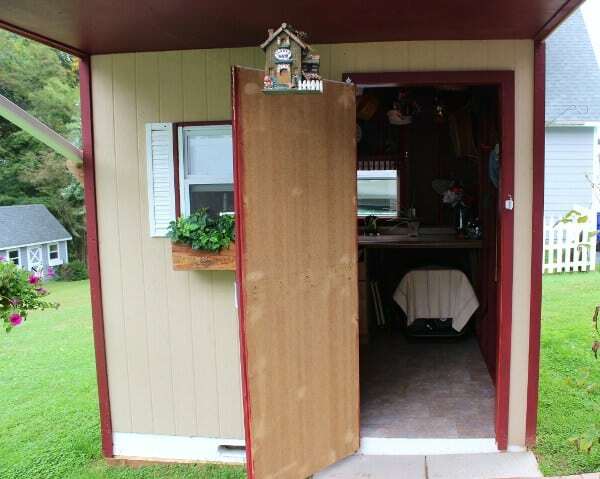 Gene put down a plywood floor inside the shed. But it was too rough to walk on with bare feet and it was tough to sweep. So they went back to the ReStore in Frederick and found just the right amount of vinyl tiles (72 to be exact) for $20. They used leftover adhesive to put the tiles down. The light inside of the shed is the original light that had hung in their kitchen when they first built their house back in 1960. 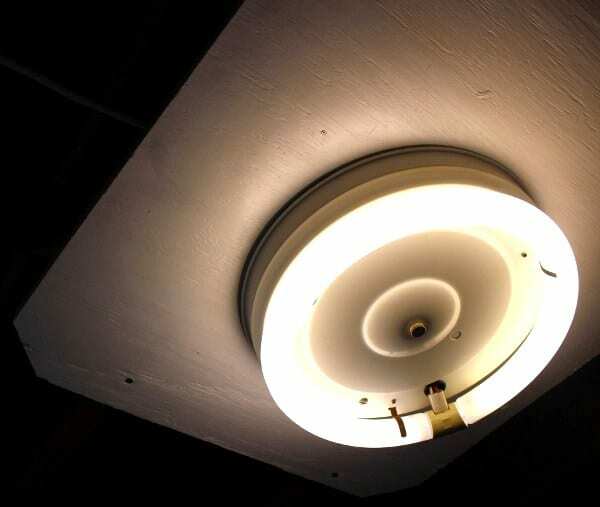 They renovated their kitchen in 1992 and replaced the light, but saved the original light thinking they might be able to use it again some day. 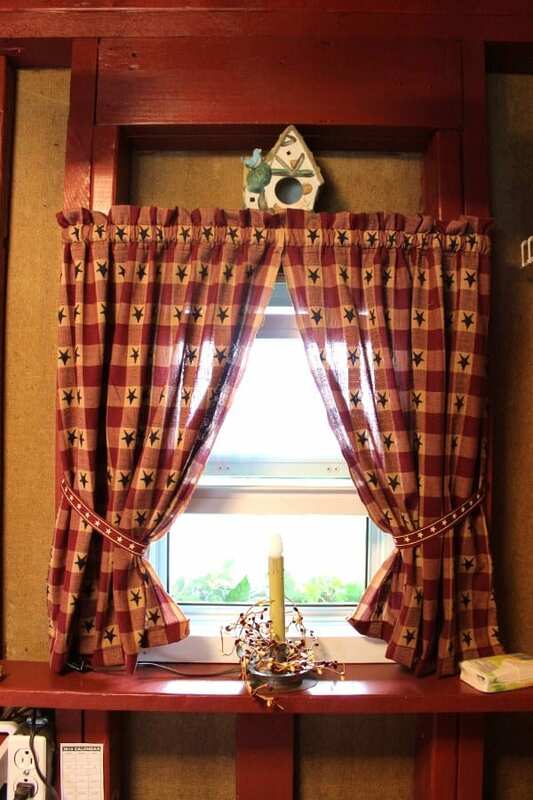 Shirley made the adorable curtains out of leftover fabric. The wire shelving came from yard sales at $1 per shelf. The counter tops came from the ReStore in Hagerstown. 16 feet for $60. Here is one of Shirley’s beautiful plants. 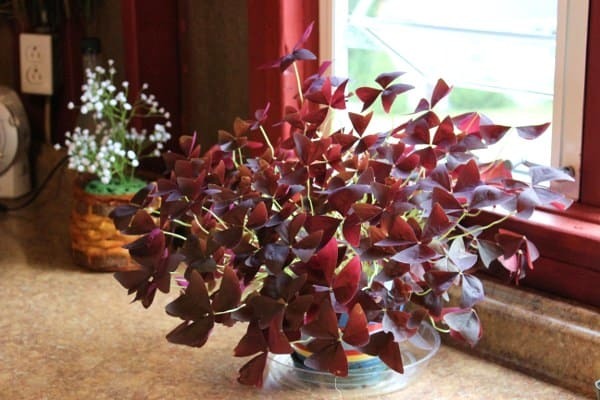 A red shamrock. 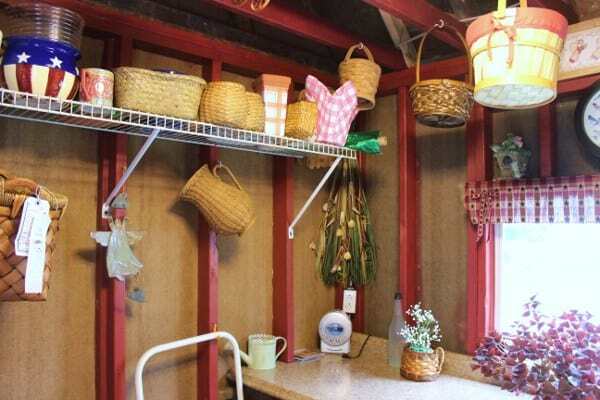 As you can see, Shirley now has a place to hang and store all of those baskets and planters she’s collected over the years. See that little aloe vera plant? Shirley gave that to me. 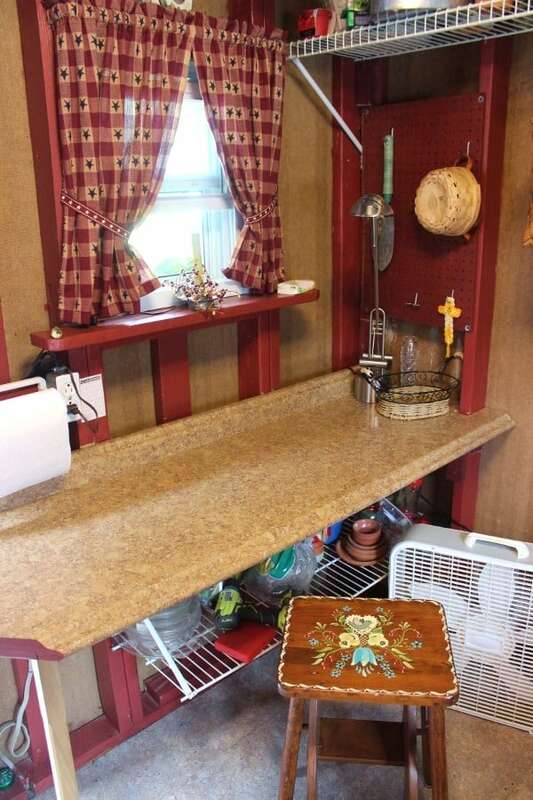 I get to benefit from her potting shed too! This cute little switch plate? Yup, you guessed it. It’s a yard sale find. 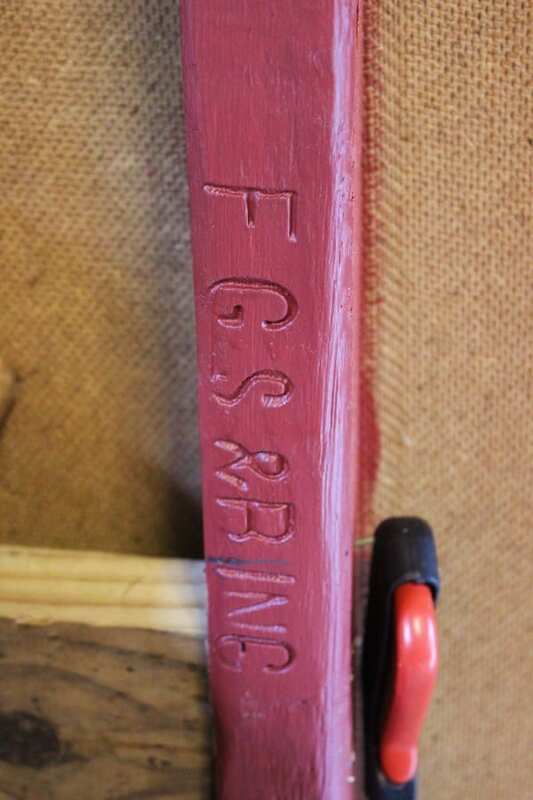 The wood trim was painted red using the leftover paint that their son used on his house. This stack of drawers came from the ReStore in Hagerstown. $20. 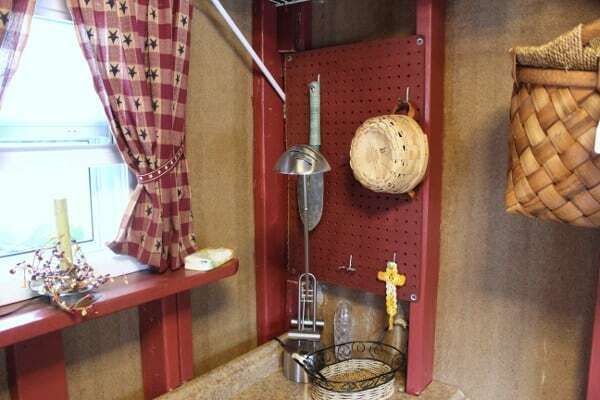 The pegboard was in storage with the wood. They painted it and hung it up. $0. 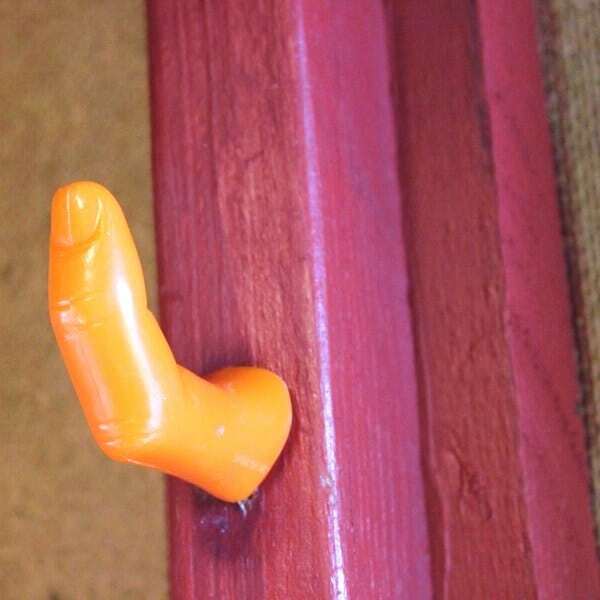 This funny finger hook came from my mom’s house. She had it stored away in a box full of junk. We had a yard sale recently with Gene and Shirley. Shirley loved it so much I told her to take it. Now it has a new life in her shed. Shirley enters many things (plants, handmade purses, recipes, etc.) to the local community show each year. She won ribbons on everything. 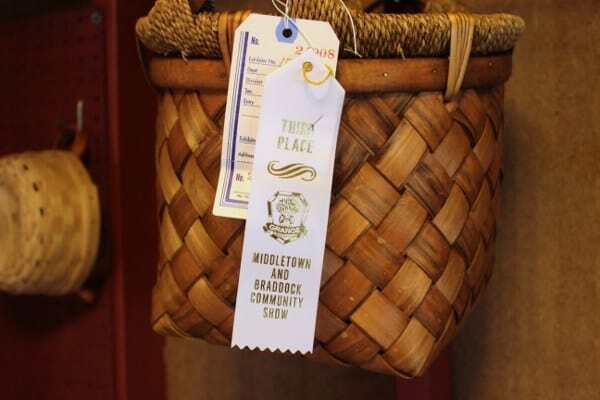 One of those ribbons was for a plant that she potted in her new shed. These two people are such an inspiration to me. They prove time and time again, that where there is a will there is a way. Not only did they save a lot of money by using recycled materials, but they did their little part by serving as good stewards to our planet. Pam is lucky to have neighbors like this. Whenever I see them they are always so nice. They absolutely would do anything for you. Nice job Pam for introducing them to your readers. They are great people!!! Thank you Kenny! I know, it’s about time I featured them. They’re an extraordinary couple. I want one so badly!!!!! 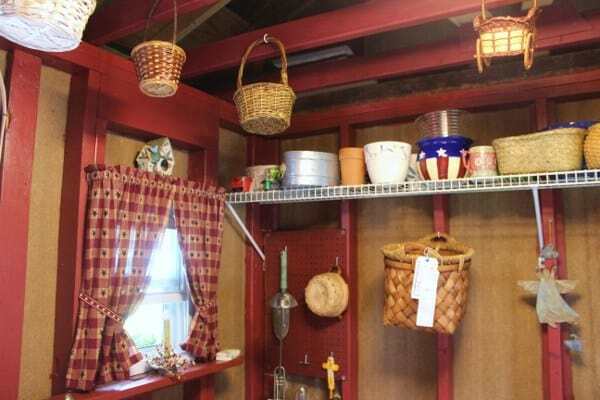 Their potting shed is absolutely adorable and boy, I could really make good use out of one here!!! What a cute couple too! ABSOLUTLEY PERFECT! Will be featuring it!